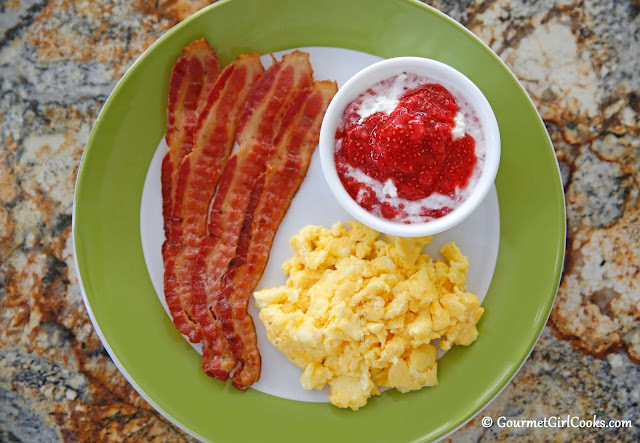 Gourmet Girl Cooks: Saturday Breakfast - Eggs, Bacon & Strawberry Cheese "Not-Danish"
Saturday Breakfast - Eggs, Bacon & Strawberry Cheese "Not-Danish"
This morning hubby and I got up early and took a walk. It was bright, sunny and only 72 degrees outside. It's still supposed to get hot today, but we finally had a cool morning to get out and enjoy. When we got back, I made scrambled eggs with cheese and bacon for breakfast. I reached for my plain Greek yogurt to swirl some of my Strawberry Chia Jam in, and while I was reaching for it, I noticed my carton of whole milk ricotta sitting beside it with only about 1/4 cup left inside. Don't you just hate wondering what to do with your leftover ricotta? I decided to put my Greek yogurt back and instead pulled out the leftover ricotta and swirled my strawberry jam into it instead. It was AMAZING! Yes, as in "I liked it even better than fruit swirled through plain Greek yogurt!" It was smooth, creamy, rich without any tartness. It was like enjoying a Strawberry Cheese Danish without the danish part! LOL From now on, I will purposely look forward to leftover ricotta to enjoy this way. Try it next time you find yourself wondering what to do with your leftover ricotta. I snapped a quick photo of my breakfast of eggs, bacon and Strawberry Cheese "Not-Danish". Enjoy! I've become a real ricotta fan, myself, and this is another amazing way to use it! Hot weather has finally caught up with us. We'll be in the frying pan this weekend and for much of next week. Well, it *is* the middle of August, I guess!